Damn. 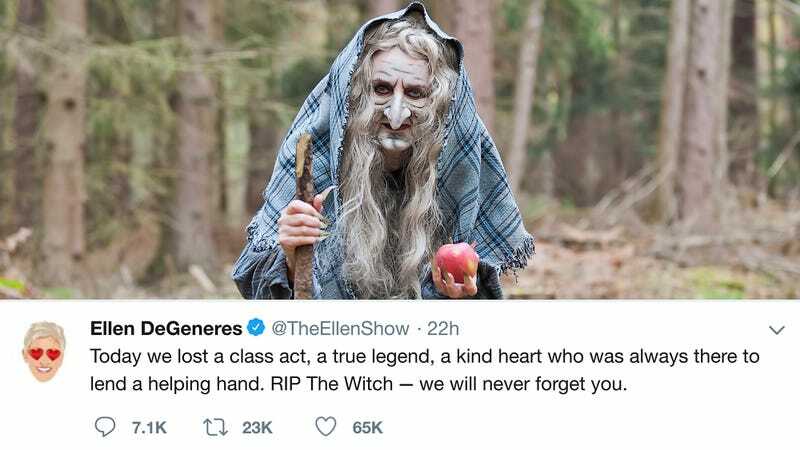 It’s tough to imagine a world without The Witch, but seeing how many incredible people were touched by her trickery and spells before she melted is a comforting reminder of just how wonderful she was. Following a shocking TMZ report that The Witch had melted into a big puddle on the floor after someone finally guessed her true name, celebrities instantly took to Twitter to express their grief about the loss. From Emma Stone to Bill Nye, it seemed like almost every star in Hollywood had a story to share about a time The Witch sucked a piece of their soul into her mysterious amulet, or pulled a bone out of her hair and gave it to them without speaking, or showed up in their dreams and taught them how to turn a cat into a wicker handbasket. Steven Spielberg tweeted out an instantly viral, never-before-seen photo of The Witch climbing out of Laura Dern’s mirror on the set of Jurassic Park with the caption “irreplaceable,” and even Beyoncé herself paid tribute with a sweet home video of The Witch glowing and hovering above her twins on the day they were born. Wow. The world is definitely hurting now that The Witch has melted on the ground—let’s hope these loving memorials are bringing some joy to those who knew her. Yep—we’re crying. It’s safe to say that the world is a little bit darker of a place now that The Witch is just a puddle of water in a bucket. It’s clearly going to take some time for the public to move on, but in the meantime, we can take a look at all the heartfelt posts about her to help us remember her legacy. RIP!